While domestic dogs (Canis familiaris) play a large role in human daily lives, little is known about how they perceive the visual world. Recent research suggests that dogs may perceive certain visual illusions differently than humans. To further evaluate geometric illusion susceptibility, eight dogs were assessed on their susceptibility to the Ponzo illusion. Four experiments were conducted: 1) a presentation of the Ponzo illusion with target circles in a ‘grid inducer context’, 2) a re-test of Experiment 1 after additional training, 3) a presentation of the Ponzo illusion with target rectangles in a ‘grid inducer context’ and 4) a presentation of the Ponzo illusion with target circles in a ‘converging lines context.’ A one-sample t-test of the dogs’ responses to the Ponzo stimuli in Experiment 1 demonstrated illusion susceptibility at the group level; however, no individual dog performed significantly above chance in binomial tests. In Experiments 2, 3, and 4, one-sample t-tests found no significant results at the group level, although one or more dogs did demonstrate a small but significant effect. Taken together, then, there was limited evidence for dogs’ susceptibility to the Ponzo illusion in a two-choice discrimination paradigm. As most animals tested previously have demonstrated human-like susceptibility to the Ponzo illusion, these findings have implications for theoretical explanations. 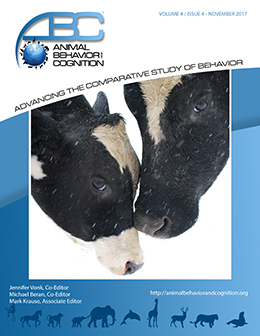 The divergence of results between dogs and humans/other animals suggest that mechanisms underlying perception of the Ponzo illusion may differ across species and that care should be taken when using visual paradigms to test dogs’ cognitive skills.